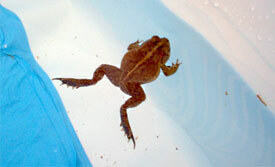 Setting up a swimming pool in your back yard may mean having an occasional uninvited guest! That’s what our grandchildren Sean and Adrian found out when they visited us last week in Mobile and Mom went to the store and got them a small wading pool. With temperatures near 80 F (27 C) it was warm enough to set up the pool. The first day went fine, although the water seemed a bit cold at first. At the end of the day Mom (our daughter Rachel) left the pool filled with water overnight. The next morning when Sean and Adrian went out to check on their pool, they found an invited guest "hanging out" – a small frog! Since they have seen frogs before when visiting us, they weren’t surprised or afraid. 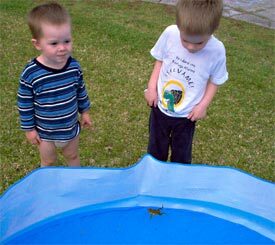 However, that morning the idea of sharing their pool with a frog wasn’t so exciting, so Mom fished the frog out with a small pail. There are plenty of other places on our property where a frog can thrive, so Mom deposited the frog in our uncultivated lower yard, which is a combined compost pile and dumping grounds for grass clippings, leaves and cut branches. Since it is a bit lower than the rest of the yard, it also retains water when it rains or when the nearby creek floods. So Sean and Adrian’s uninvited pool guest was simply deposited somewhere else where he could also feel at home, and Sean and Adrian had their pool all to themselves again.